Last week I stopped by in the late afternoon, so it was still very sunny (being April in South Florida! ), not the best time of day for photographs. But it didn’t seem to affect the variety and number of birds out and about! 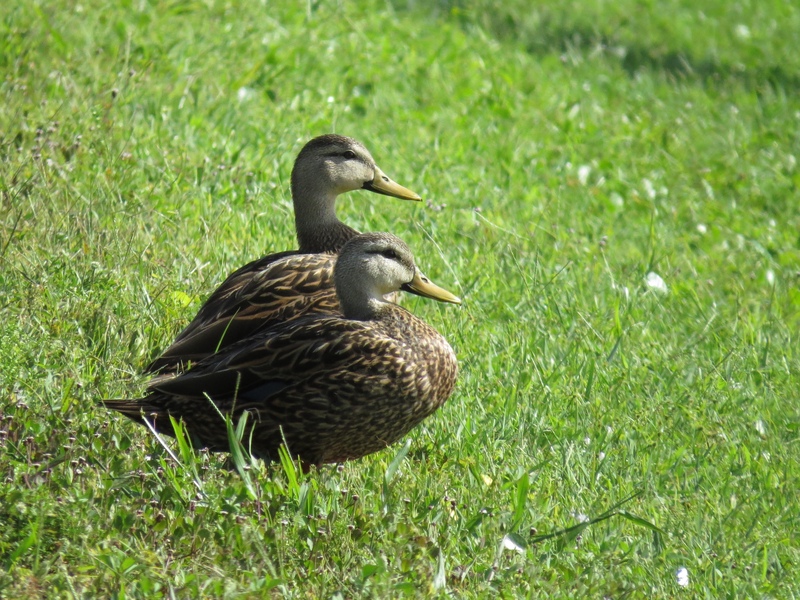 Just as I entered the Sanctuary, this cute pair of Mottled Ducks was cavorting about, taking turns dunking for a snack. 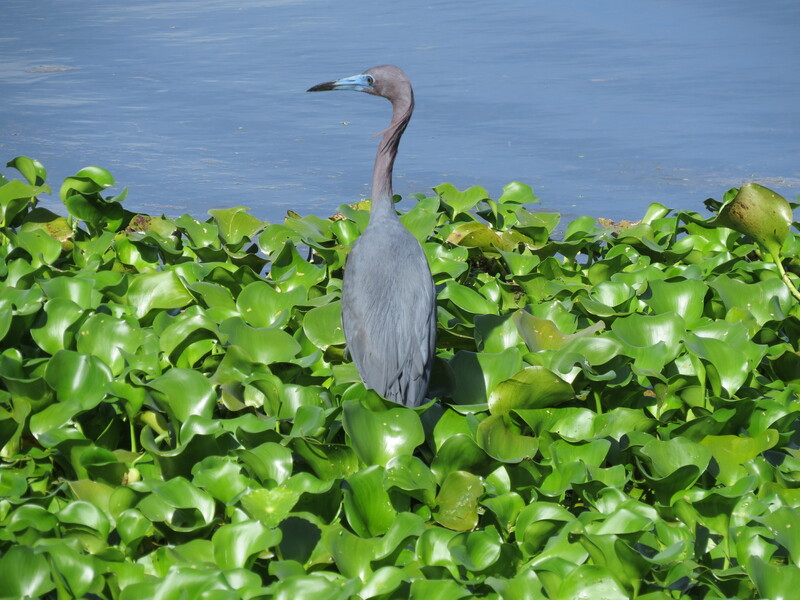 A few steps down the boardwalk, I spotted this Little Blue Heron nestled in the greenery, surveying the scene. 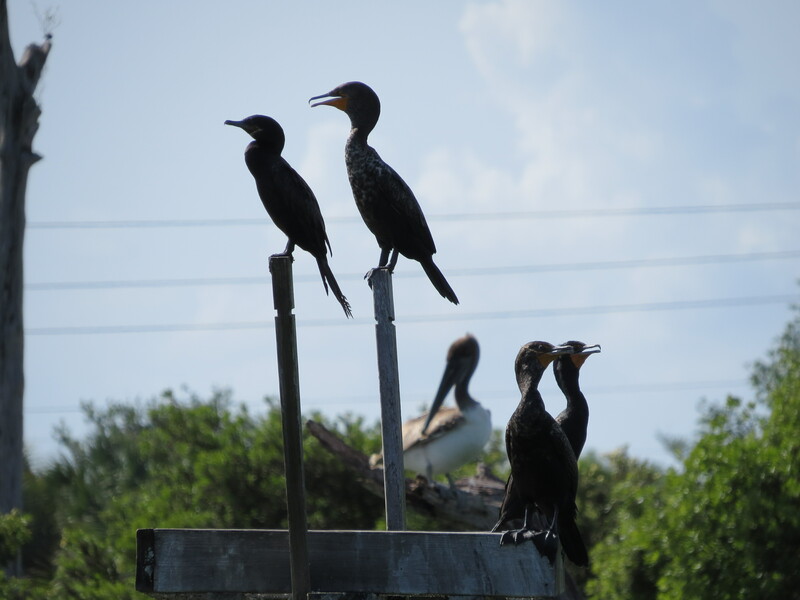 Off to the left, these Cormorants were keeping a watchful eye over the Wetlands. 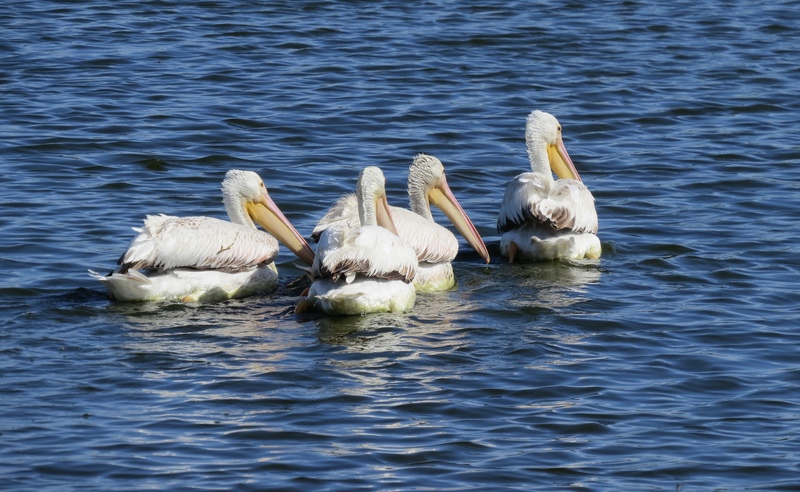 Just beyond the Cormorants, I caught sight of a pelican, and shortly discovered that both a Brown Pelican and a group of White Pelicans had stopped by on the same afternoon – what a treat! Now keep in mind, I’m not including every single bird I saw – but this was shaping up to be a pretty diverse collection! 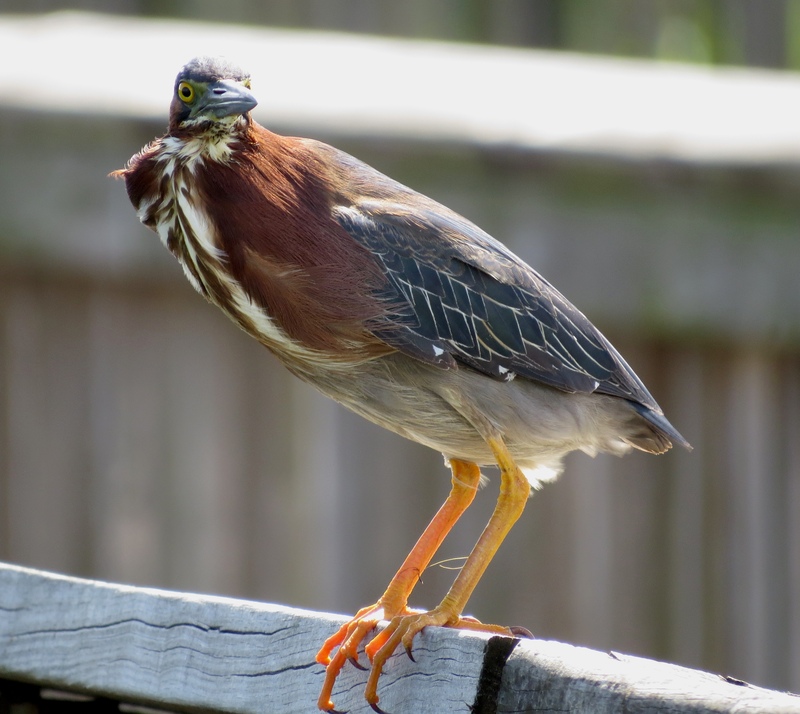 Why, even this little Green Heron seemed to do a double-take at the number of species who had flocked to Peaceful Waters that day. 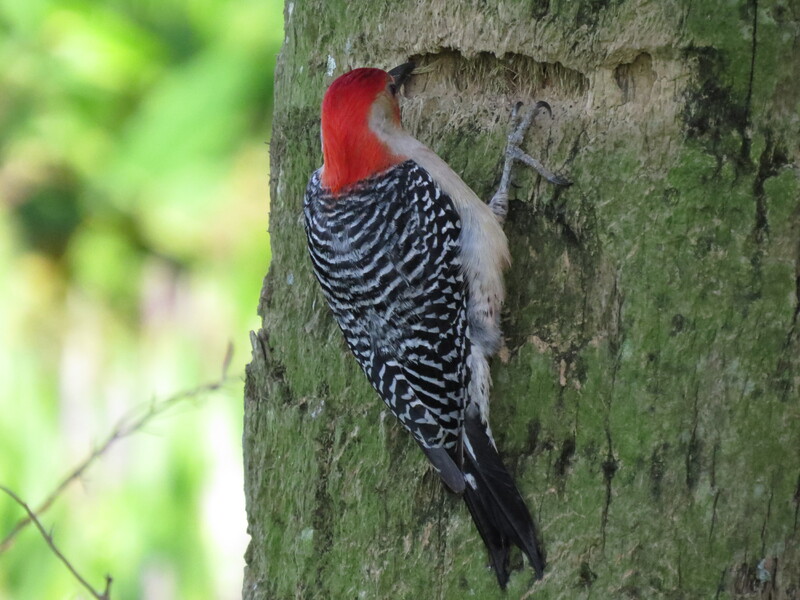 I heard the unmistakable sound of this busy Red-bellied Woodpecker as I strolled along the secluded paths on the other side of the Sanctuary. But he soon flew off, so I mostly saw him from the back ;-). 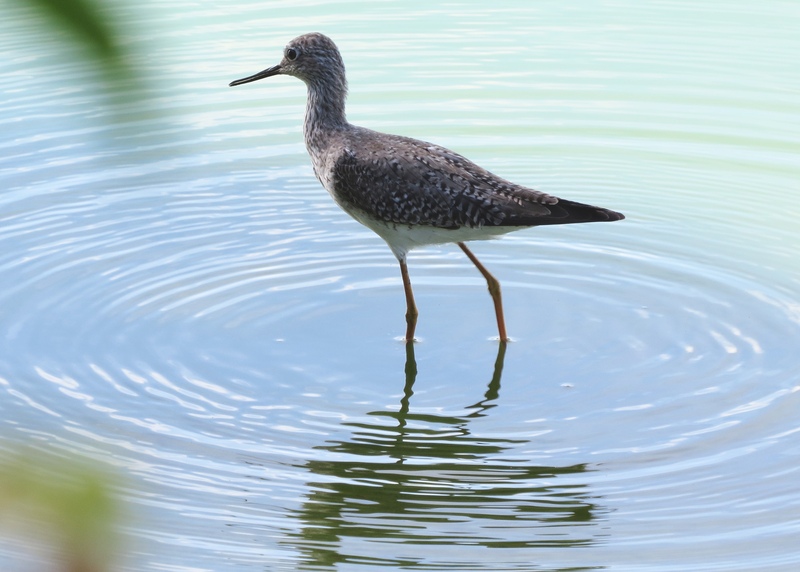 Turning down the grassy lane toward the back of the Sanctuary, I peeked through the fence and saw several Lesser Yellowlegs, Black-necked Stilts, and their friends foraging in the grass and along the shallow water’s edge. 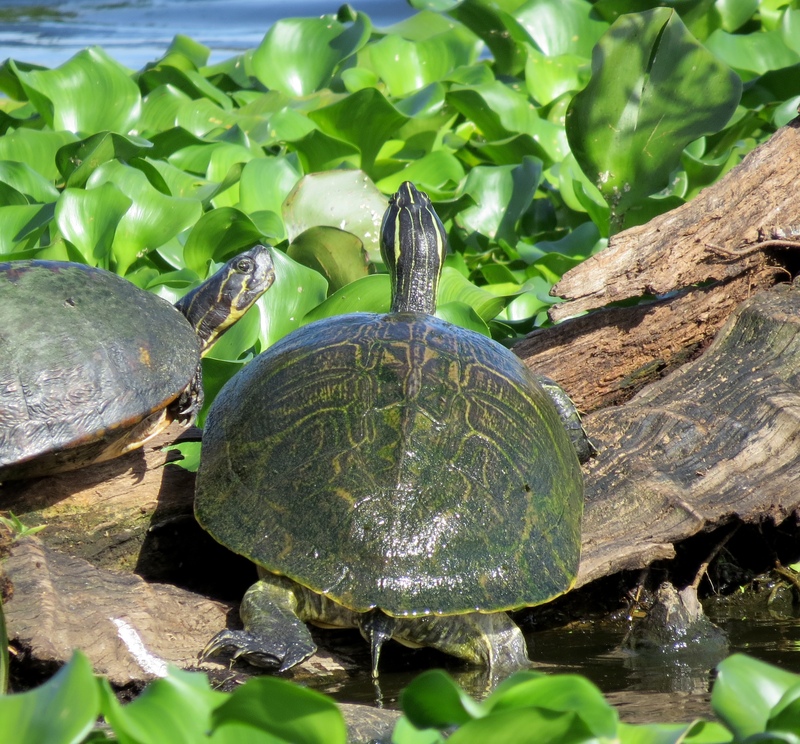 A couple of happy- looking Turtles were sunning themselves on a log jutting out into the cool blue water. 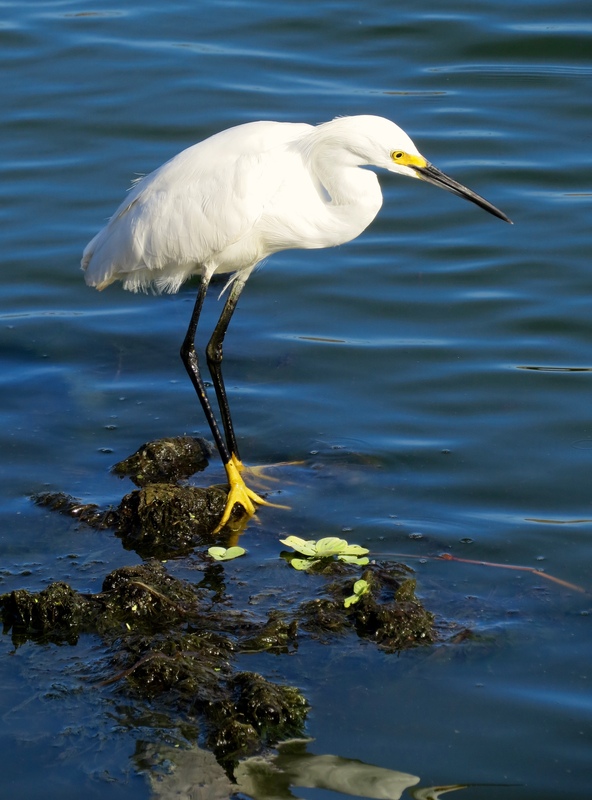 Another pair of Mottled Ducks looked pretty relaxed as they stood watch on the grassy shoreline, and this Snowy Egret was out fishing off the ‘pier’ in the bright late day sunshine. 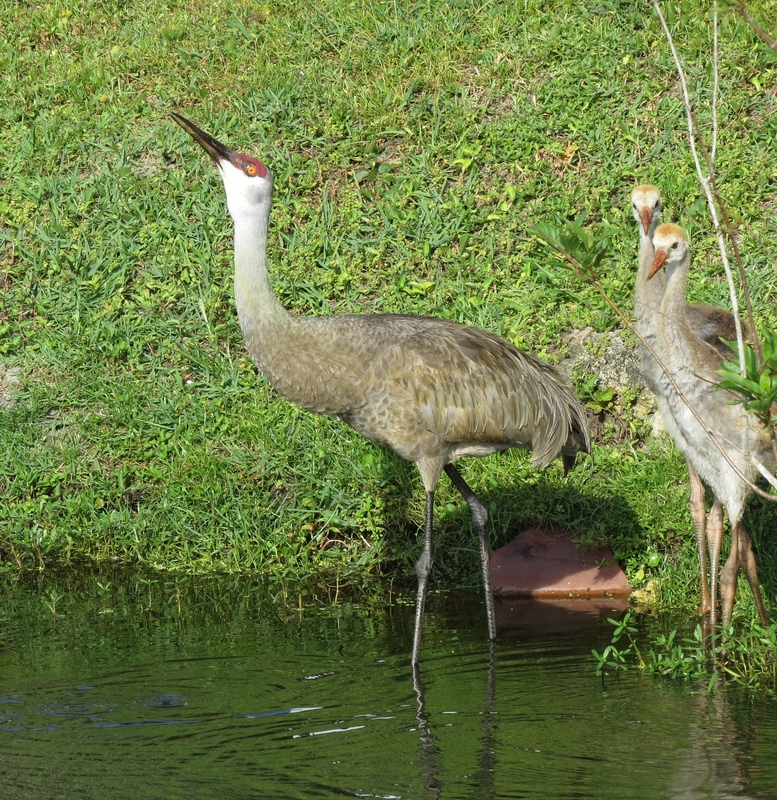 After making my way back to the entrance, I was fortunate to happen upon the Sandhill Crane family before I left – those babies sure do grow fast! This post doesn’t even include the Warblers and other songbirds I saw, or the Great Blue Herons or Great Egrets that occasionally swooped by overhead, but it illustrates the amazing variety of species we can see all in one place, less than 30 minutes from home, on a short hour and a half walk! 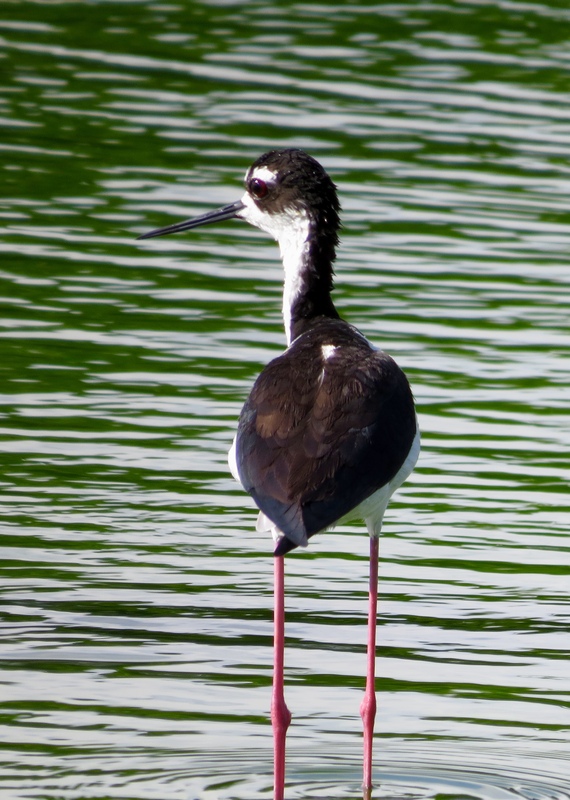 This entry was posted in Birds, Marsh/Wetlands and tagged Black-necked Stilt, Brown Pelican, Double-crested Cormorant, Green Heron, Lesser Yellowlegs, Little Blue Heron, Mottled Duck, Red-bellied Woodpecker, Sandhill Crane, Snowy Egret, White Pelican. Bookmark the permalink. I must find this place next time I’m down for a visit!! Absolutely! Can’t recall if I had mentioned it to you this last time. Such beautiful photos. You did have a peaceful day of birding. I wish we had little blue herons and white pelicans. I am hopefully birding on Sunday, but it has been below freezing, so not sure what I will see. Yikes, below freezing? Again? Someone told me this evening that it snowed again in upstate New York today! 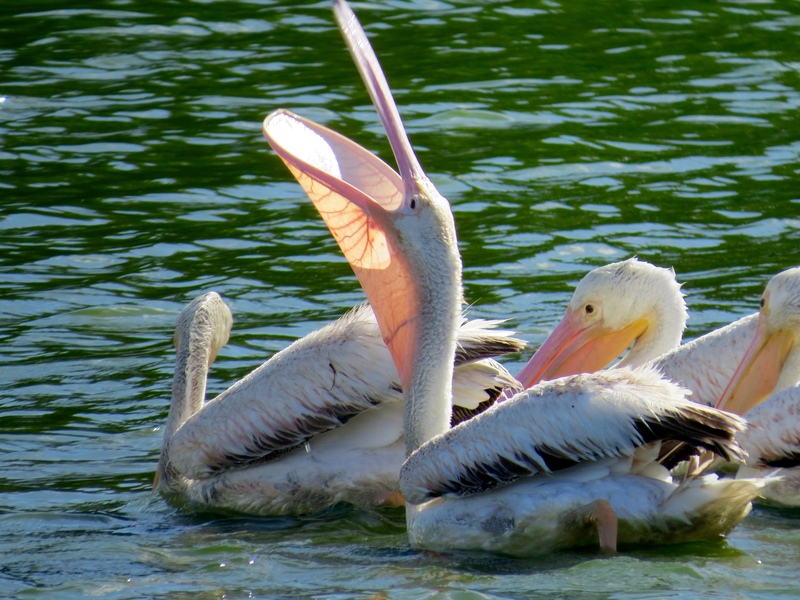 Terrific shots of this absolutely outstanding variety of amazing wildlife! Well done. Thanks for your visit, Phil. This is a place I only visit occasionally, and I was struck by how many different species I saw in one short walk! Much appreciated, Jet! 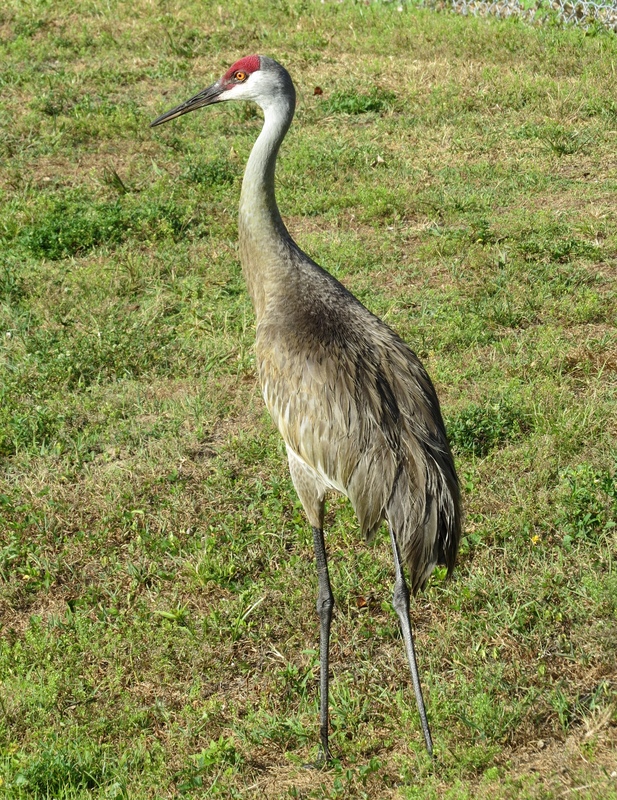 Only wish I had gotten there sooner to see the Sandhill Crane chicks when they were smaller. I really hope you will stop by this great sanctuary when you’re in Florida. 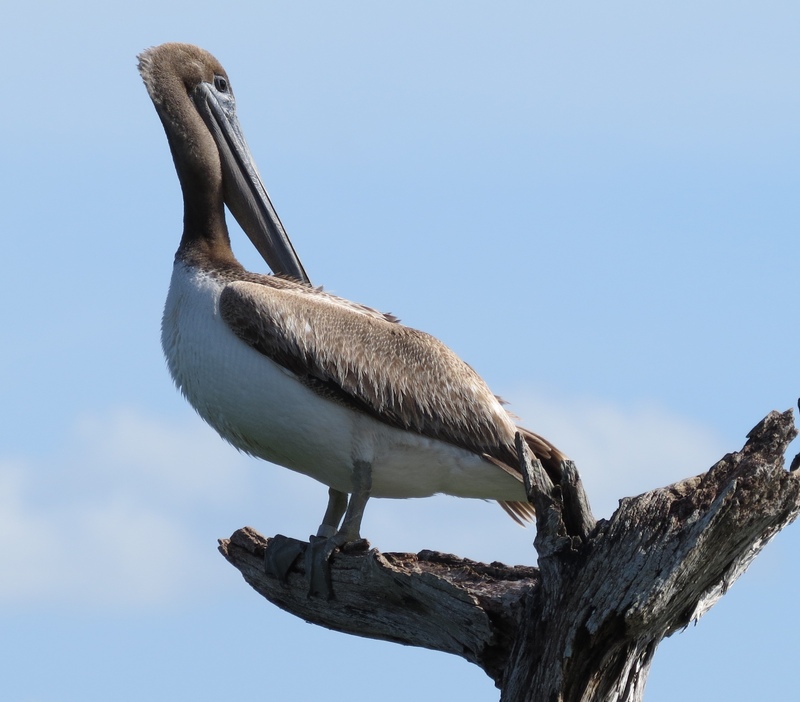 Florida is an amazing birding state, and Palm Beach County alone is filled with beautiful preserves. 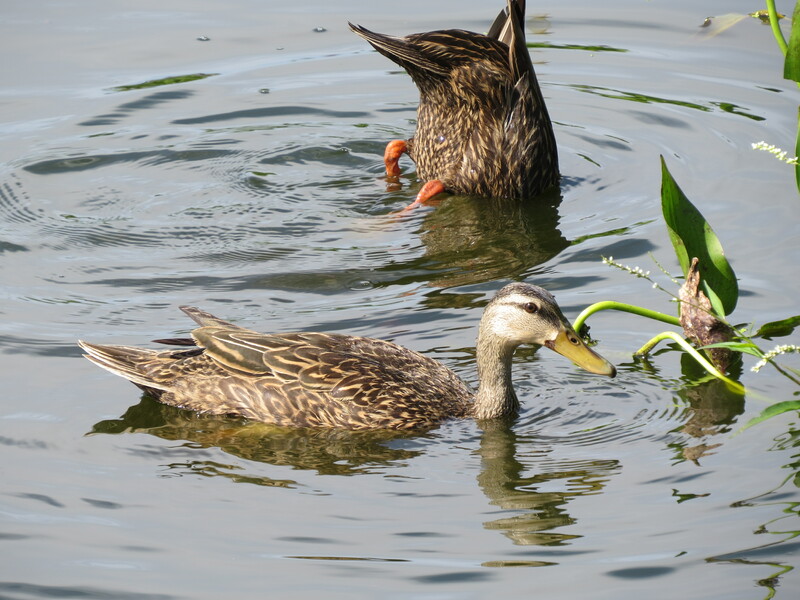 A beautiful selection of waterbirds. I love these places they are real sanctuaries, and the fact that it is so close to home for you and hosts so many birds is a wonderful delight. Thanks for sharing! Thanks for visiting, AB! Yes, I can’t get over how wonderful it is to be in such close proximity to so many beautiful places.